Selecting the right polymer and dose is integral for maximizing the dewatering process for Bishop Water’s solids management solution. Polymer selection can seem like a daunting task since hundreds of polymers are available and each is formulated to work best with the specific properties of the solids that are being dewatered. 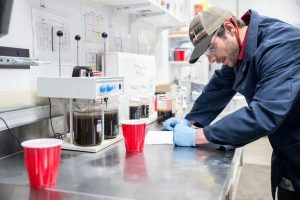 To ensure that maximum dewatering occurs in a full-scale system, an experienced polymer specialist from Bishop Water’s team can use bench testing to determine the chemical specifications needed to flocculate and dewater solids at a particular site. On this episode of the Bishop Water Podcast, Christine Gan, a Wastewater Engineer in Training (E.I.T.) at Bishop Water, describes what type of equipment is used in Bishop Water’s lab to undertake the bench testing and showcases the different types of tests that can be undertaken to optimize the polymer and dosage rates for a site. In doing so, Christine describes how bench testing can provide clients with an accurate picture of how a full-scale solids management solution will operate at their site. Learn More about our various testing methods. Contact us to arrange a quick, easy, no obligation test of your material.